The South Korean government said Thursday that it will control the number of houses and apartments supplied in the market, and strengthen regulations on mortgages as part of efforts to contain its household debt. With the country’s household debt increasing at a fast pace on low interest rates this year, the Finance Ministry said that it will restrict the supply side of the housing market rather than the demand side to ease the debt problem, as well as housing oversupply. Financial policymakers and regulators will also enforce that banks and nonbanks assess whether potential homebuyers are qualified to borrow and purchase homes in accordance with their annual income. 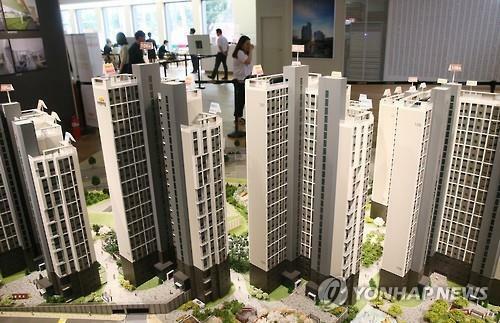 “We will strengthen the process related to housing supply such as through the reduction of land supplied to the market (for housing development) to stabilize household debt,” Finance Minister Yoo Il-ho said in an economic-related meeting Thursday. The new measures come as the central bank early this month highlighted a problem with households borrowing too much from nonbanks such as mutual savings this year, amid increased loan restrictions at commercial lenders. Korea’s household debt reached more than 1,257 trillion won ($1.1 trillion) in the second quarter of this year, up 125.7 trillion won, or 11.1 percent, from a year ago, the Bank of Korea said Thursday. This marked the highest increase since the fourth quarter of last year when the debt grew by more than 38 trillion won. 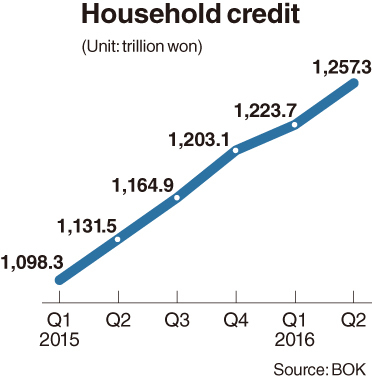 What was more troubling was that more than half of the debt taken out by households were mortgages, and that household loans from nonbanks reached 266.6 trillion won in the second quarter of 2016, up 10.4 trillion won from the first quarter, the BOK said. This marked the first time nonbank loans increased by more than 10 trillion won since the central bank began compiling data in early 2000s. With the central bank’s growing calls for additional policy measures to curb rising household debt, the Finance Ministry said that it will enforce lending guidelines to toughen banks and nonbanks’ evaluation of borrowers. The government will also strengthen its financial assessments of housing developers as a means to restrict the number of homes supplied in the market. This means that should developers fail to secure adequate financial capability guaranteeing that they can complete their projects in time for pre-sales and sales of houses to the public, they will not be able develop land and houses. “We believe (the debt) will stabilize if we control the speed of land purchases and project financing, as well as strengthen the lending guidelines against borrowers,” Deputy Finance Minister Lee Chan-woo told reporters. Through its new measures, the Finance Ministry expects the number of houses for purchase in the market to reach less than 30,000 from 50,000 on average a year. The government, however, said that it will not further strengthen regulations on home sales after purchase. Currently, Korea does not allow buyers to sell their apartments in the metropolitan areas within six months after purchase and a year for apartments on land owned by the state. “A tougher measure (on home resales after purchase) could abruptly worsen the housing market. Our new measures are focused on controlling the supply side,” Lee said, siding with the Ministry of Land, Transport and Maritime Affairs, which was against extending the timeframe for the resale restriction.